The flags are flying as a part of the Flags to Fight Hunger program are honoring Labor Day and will remain up to honor Patriot's Day, 9/11. Thank you to all flag supporters! Shelbyville Varsity Football team selected Mrs. Sonya Parker as Teacher of the Week. Mrs.Parker has worked at Shelbyville High School for fourteen years. She also graduated from Shelbyville High School in 1993.Mrs.Parker has three lovely children. She has been in the athletic booster program for five years. Her two favorite memories from Shelbyville are when the football boys almost went for state and when the basketball boys went to state. Her favorite sport is baseball. Mrs.Parker says she is shocked and says it feels amazing to be a teacher of the week. We are excited to offer something new this year and hoping to provide an easy way to promote school spirit not only for our students and staff but for all our wonderful supporters. The link below will offer a variety of shirts and jackets with Tenaha’s logo. As the store grows more items will be added so keep checking back to see what is new. August 31, 2018-Tigers vs Troup 7:30 pm Home; Tenaha Youth Center - 5th Quarter after the game for students 7-12th grades. The link below will offer a variety of shirts and jackets with Tenaha’s logo. Just left click below, click open, and it will take you there. Tenaha Youth Center will have their first 5th Quarter after the game tonight for students 7-12th grades. August 31, 2018-Tigers vs Troup 7:30 pm Home; Tenaha Youth Center - 5th Quarter after the game Friday night for students 7-12th grades. Tenaha Youth Center will have their first 5th Quarter after the game Friday night for students 7-12th grades. Please feel free to join us tonight night at 6:00 pm in the TISD cafeteria for an organizational town hall meeting to establish the TENaha TOGETHER movement. ..... TENaha TOGETHER is a ten person committee with representation from the school, the city, the Tenaha Businessmen’s Club, and at-large members of the community to come together and simply seek to raise funds for community improvement projects. The first targets are Christmas lights and decorations, welcome signage on 59/84/96, and new decorative banners and bunting for town. In all, the target for these projects is $25,000 and the city of Tenaha got it off to a great start by pledging $3,500 at last night’s council meeting. Everyone is welcome to attend but volunteers are also being sought. · Lady Dragon Volleyball against Timpson at Shelbyville. 7th grade plays at 4:30 pm and 8th grade at 5:30 pm. · JV Football plays against Beckville at 6:00 pm on Thursday 8/30/18 in Shelbyville. · Varsity Football plays against Beckville at 7:30 pm on Friday 8/31/18 in Beckville. · Football Teams teacher of the week is Sonya Parker. · JV & Varsity Lady Dragon Volleyball plays against Overton at 4:30 pm in Overtone. · Varsity Lady Dragons plays against Beckville at 4:30 pm in Beckville. 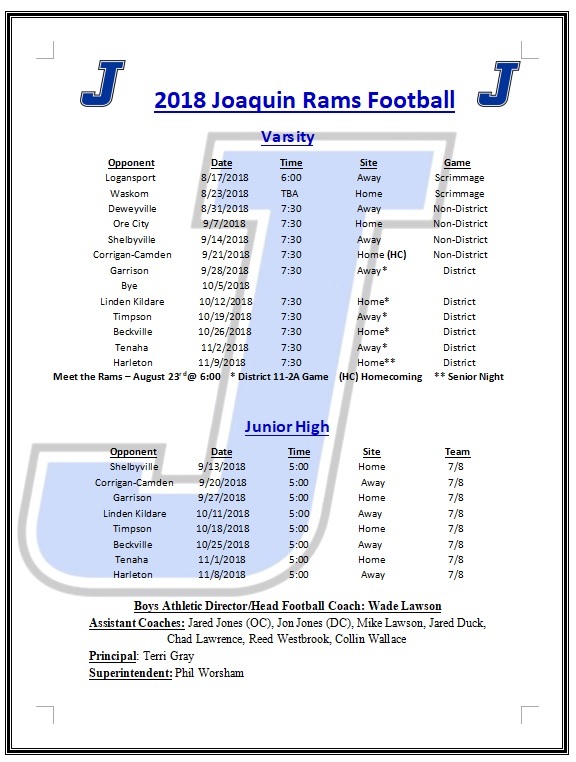 · JV Football plays against Sabine at 6:00 pm on Thursday 9/6/18 in Sabine. · Varsity Football plays against Sabine at 7:30 pm on Friday 9/7/18 in Shelbyville. Stephen F. Austin State University’s annual School of Art Faculty Exhibition will open with a reception from 6 to 8 p.m. Thursday, Sept. 6, in The Cole Art Center @ The Old Opera House in downtown Nacogdoches. Each year, the art faculty exhibition features a wide variety of artworks in ceramics, sculpture, photography, painting, prints, metals and mixed mediaThis year’s featured faculty artist is Daniel Anguiano, assistant professor of graphic design in the School of Art. The Stephen F. Austin State University School of Art and the Friends of the Visual Arts will present a free, one-night screening of the documentary “Unbranded” at 7 p.m. Friday, Sept. 7, in The Cole Art Center @ The Old Opera House in downtown Nacogdoches. In this film directed by Phill Baribeau, four young cowboys hatch an outrageous plot to adopt, train and ride a string of wild mustangs 3,000 miles from Mexico to Canada through the wildest terrain of the American West. Faculty members of the Stephen F. Austin State University School of Music will be the featured performers during the annual Pi Kappa Lambda Music Faculty Showcase at 7:30 p.m. Thursday, Sept. 20, in Cole Concert Hall on the SFA campus. The concert showcases the talents of the diverse School of Music performing faculty. All concert proceeds benefit the Pi Kappa Lambda scholarship the School of Music gives each year to the sophomore music major with the highest grade point average. Tickets are $15 for adults, $10 for seniors and $5 for students. For tickets or more information, please visit www.finearts.sfasu.eduor call (936) 468-6407 or (888) 240-ARTS. This riotous romp through each of the Bard’s plays is at 7:30 p.m. Tuesday, Sept. 11, in W.M. Turner Auditorium on the SFA campus. Single event ticket prices for the University Series are $25 for adults, $20 for seniors and $10 for non-SFA students/youth. Tickets for SFA students are $3. The play is recommended for mature audiences. Please feel free to join us Thursday night at the TISD cafeteria for an organizational town hall meeting to establish the TENaha TOGETHER movement. ..... TENaha TOGETHER is a ten person committee with representation from the school, the city, the Tenaha Businessmen’s Club, and at-large members of the community to come together and simply seek to raise funds for community improvement projects. The first targets are Christmas Lights and decorations, welcome signage on 59/84/96, and new decorative banners and bunting for town. In all, the target for these projects is $25,000 and the city of Tenaha got it off to a great start by pledging $3500 at last night’s council meeting. Everyone is welcome to attend but volunteers are also being sought. Homecoming is September 29th for the Tenaha Tigers. This year's homecoming theme is "The Power of Champions" featuring Super Heroes! This homecoming we will celebrate the 20 year reunion of the 1998 State Champions . Make plans to join us for this year's homecoming! The Center Varsity and Junior Varsity Football Team will begin practice at 7:30 a.m. on September 3. The freshmen will not have practice. Shelbyville School board meetings Thursday, August 30th. The Joaquin vs. Deweyville high school football game scheduled for Friday, August 31st, in Deweyville will begin at 7:00 p.m. instead of 7:30 p.m.
Panola College Volleyball capped opening week with four solid wins, including two against ranked opponents, this weekend at the NMMI Classic in Roswell, NM. Panola opened with a sweep of Yavapai College: 25-22, 25-14, 25-23. Sophomore right side Alyssa Lozoya pounded out 10 kills hitting a stellar .421, sophomore middle blocker Daphinie Correa added 8 kills and 3 block assists, and freshman outside Sabrina de Lima added 7 of her own. Sophomore setter Molly Harris dished out 24 assists, with freshman Bri McGown adding 17. Defensively, sophomore Thaynara Godoi picked up 1 solo block and assisted on 3 more. Sophomore, libero Hannah Ramirez anchored the floor defense with 14 digs. In their second match of the day, PC took down 9th ranked Seward County in a thrilling 5-set match (25-23, 21-25, 16-25, 25-15, 15-10). Aggressive serving (8 aces) and solid blocking (16 total) gave the Fillies the edge in an otherwise tight match. Daphinie Correa was a force at the net with 4 solo blocks and assisting on 7 more, while Thaynara Godoi added 1 solo and assisted on 4. Offensively, Sabrina de Lima led with 11 kills, added 3 block assists, and 2 aces. Sophomores Rebecca Rabius and Alyssa Lozoya chipped in 7 kills apiece and combined for 6 block assists. Bri McGown led with 17 assists and 6 digs, and Molly Harris added 13 assists, 9 digs and 2 aces. Hannah Ramirez had a solid all-around match picking up 9 assists, 12 digs, and 2 aces. (Correa and de Lima block an attack against North Lake). Saturday, the Fillies overcame a slow start to take down #17 Hutchinson Community College (17-25, 25-12, 25-17, 25-22). Panola bolstered a balance attack with 5 players adding 7 or more kills and 2 block assists apiece. Daphinie Correa and Rebecca Rabius led with 9 each, Thaynara Godoi notched 8, Alyssa Lozoya and freshman Carol Santana added 7 each. Santana impacted the match in several categories, hitting .429, picking up 12 digs, and 2 aces. The setting duo of McGown and Harris combined for 42 assists, (23) and (19) respectively. Ramirez notched her highest dig total of the tournament with 16 and 3 aces. Panola finished their weekend with a sweep of Odessa College (25-22, 25-19, 25-19). Rabius once again led with 10 kills on .400 hitting and Godoi added 6 kills on .545 hitting and 3 total blocks. McGown dished out 20 assists with 6 digs, and Harris picked up a double-double by adding 12 assists and 10 digs. Ramirez led with 11 digs and de Lima added 6 of her own. The Fillies will return to action Wednesday when they travel to Temple College before concluding the week at the Kruse Kickoff Classic hosted by Blinn College Friday and Saturday. The Joaquin School Board held a public meeting at 5:30 p.m. on Tuesday, August 28, 2018 in the Boardroom at the Joaquin ISD Administration Building. The purpose of this meeting is to discuss the school district’s 2018-2019 Budget and proposed Tax rate. Panola will return to action at the NMMI Classic in Roswell, New Mexico against Yavapai College at 3 pm. Panola College is pleased to announce the addition of Kindermusik playdates through their Workforce and Continuing Education department. These first two Kindermusik classes will be loaded with old farm favorites, circle dances, and lots of learning. Plus, your little one will leave with a mini-kit including a 10-song download card and an instrument. Established in 1978, Kindermusik is the leading provider of music-based education for children from birth to age 5. In every Kindermusik class, your child is welcomed into a playful and nurturing environment where they will sing, move, play instruments, and hear stories—all while developing social skills, problem-solving skills, pre-math skills, and a foundation for reading. Our research-based curriculum focuses on whole-child development and helps you understand how your child is developing musically, cognitively, and socially. Learn more about Kindermusik at www.kindermusik.com. Two Shelbyville High School graduates have been selected as Texas Interscholastic League Foundation (TILF) scholarship recipients for 2018. Ty Fox received the John Porter King, Jr. Memorial Scholarship in the amount of $1,000. Justin Harbison received the Mr. & Mrs. Lloyd T. Jones Memorial Scholarship in the amount of $2,500. TILF provides scholarships to students who excel in UIL academic contests. A full listing of students across the state receiving awards can be found at http://tilfoundation.org/news-and-events/recipients/. TILF awarded 293 new and 196 continuing scholarships this year totaling nearly $1 million. To find out more about the Texas Interscholastic League Foundation, visit the UIL website. Like the TILF Facebook page or follow on Twitter or Instagram to receive updates and deadline notifications. Reserved Seating – If you are interested in purchasing reserved seating, see Sherri in the Central Office - 936/254-2463 Ext. 4100 or 936/558-4100. Seating will be available for purchase on Thursday morning. If you had seats last year and want to keep those seats, see Sherri as soon as possible. First come first served. Senior Citizen Passes – Senior Citizen Passes for those persons 63 years young or older will be available Thursday morning from Sherri in the Central Office. College News – Mrs. Behrens reports that Panola College classes begin Aug. 22nd! Dual credit students need to come up to the high school and check in with Mrs. Samford and Mr. Richardson. Work ahead….don’t get behind. It’s a Great Day to be a Panola Pony and a Timpson Bear! Western Texas Classes have begun! Aug. 20th! Please see Mrs. Samford immediately if you have not logged in. UTPB classes begin Aug. 27th along with SFA! A Special Called Meeting - Board Training of the Board of Trustees of Center ISD will be held August 21, 2018, beginning at 1:00 PM in the Center Independent School District Administration Boardroom 107 PR 605 Center, TX 75935. The subjects to be discussed or considered or upon which any formal action may be taken are listed below. Items do not have to be taken in the same order as shown on this meeting notice. Shelbyville I.S.D. is pleased to announce that all Shelbyville I.S.D. retirees will be admitted free of charge to home athletic events for the 18-19 school year by presenting a special pass. If you are a Shelbyville I.S.D. 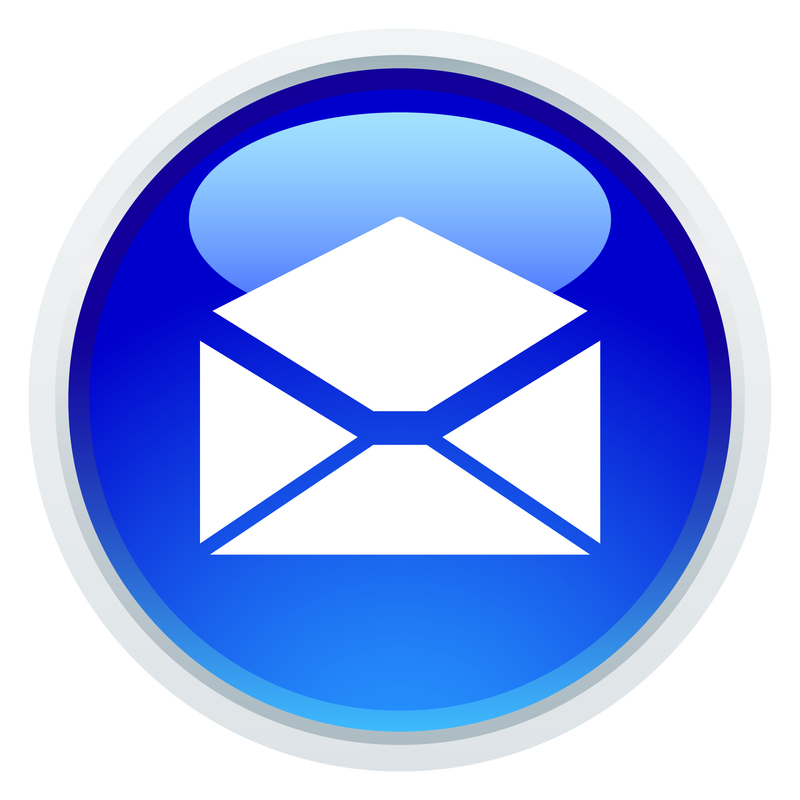 retiree and do not receive a pass by mail, please come by the administration office or call 598-2641. 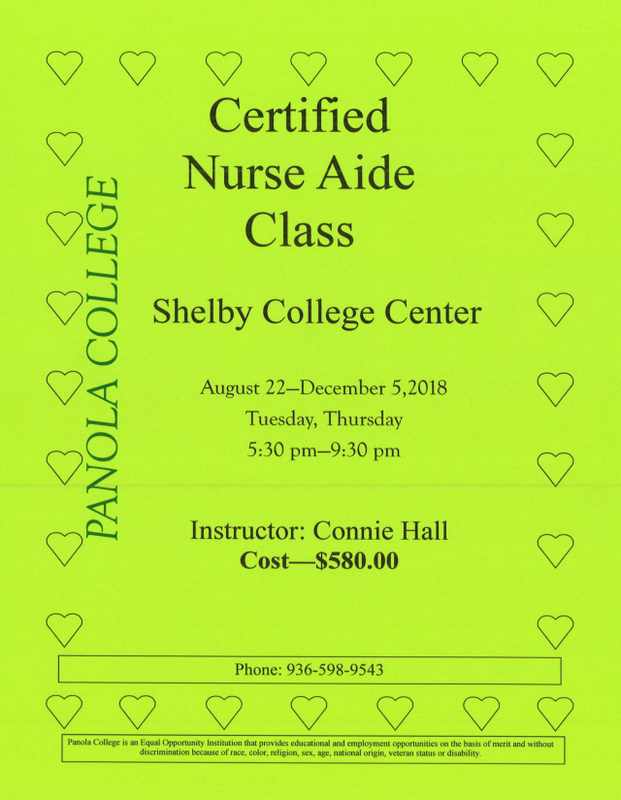 Panola College at our Shelby College location in Center, is offering Certified Nurse Aide Courses beginning August 22-December 5, 2018. We have two options for prospective students. On Monday and Wednesday evenings from 4:00 p.m. – 8:30 p.m., and Tuesday and Thursday evenings from 5:30 p.m. – 9:30 p.m. For more information and to register, contact the Shelby College Center at 936-598-9543 or email: tmccann@panola.edu. who reside in Shelbyville I.S.D. by presenting a Shelbyville I.S.D. Gold Card Pass. at your convenience to pick up a Gold Card. 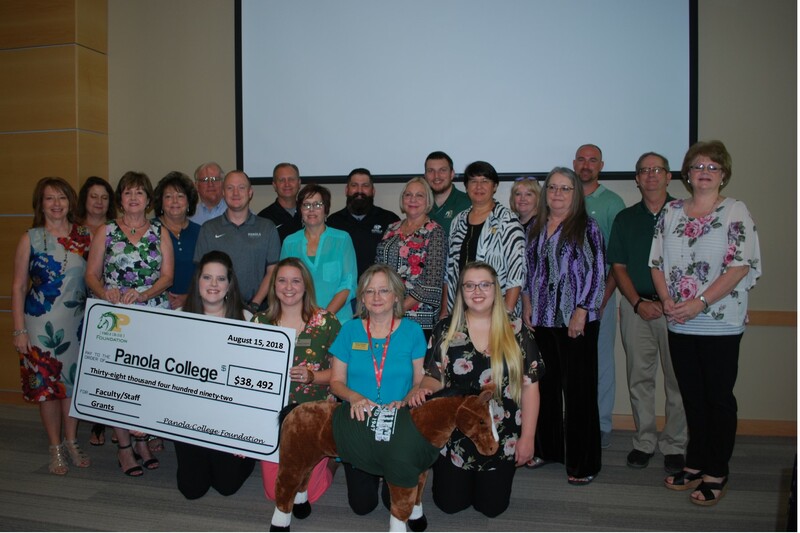 On Wednesday, August 15 Panola College faculty returned to campus excited by a new year. The Panola County Chamber of Commerce welcomed faculty and staff with donuts, coffee and their own enthusiasm for the new semester. After a brief welcome back by Dr. Billy Adams, Mrs. Brenda Giles, 2017-2018 Chair of the Panola College Foundation, was welcomed to the podium to announce the 2018 faculty and staff grant recipients. Giles expressed the Panola College Foundation’s gratitude to all those who showed their support to Panola College over the years and then called the grant recipients forward to accept their award. Cristie Ferguson & Jody Harris from Library and Student Services, receiving a $1,000 grant for Kanopy, a new video streaming service for students and instruction. Emily Zabcik was awarded a field trip to Six Flags over Math for a total of $2,750. Jacky Andreatta received $2,473 to purchase aMarcPro and Evac-U Splint system for kinesiology and athletic training. Roberta Collinsworth was granted $500 to purchase math-based children literature for “Math for Teacher” courses. Eddie Kite and Grant McMillan received a joint grant of $5,000 for a shoot away gun for both women’s and men’s basketball. Amanda Clements will be purchasing $4,599 worth of art equipment to update the art labs. Dwaine Hubbard received 3 new amps for the band for a total of $1,000. Ginger Cook was awarded $6,200 to purchase 8 Yamaha P115-B pianos for the instrumental and vocal music department. Shay Joines received $700 to purchase a Canon Digital camera to record and archive events on campus. Sherri Baker was granted $2,000 to bring the Jacob A. Riis: How the Other Half Lives Exhibit to the Allison Art Gallery. Teresa Beasley and the humanities department received $1,500 to take students on a museum field trip this fall and spring. Betty Gruber received $2,782 to purchase new beds for the C.N.A. testing center in Marshall. Cheri Lambert and the OTA department were awarded $6,088 to take her students to attend the national OTA conference. Michael Pace with the School of Energy received a grant for $1,900 to provide fire extinguisher safety training to the energy program. Information about how to make a gift to Panola College is available online at www.panola.edu/panola-foundation, or by calling 903-693-2029. 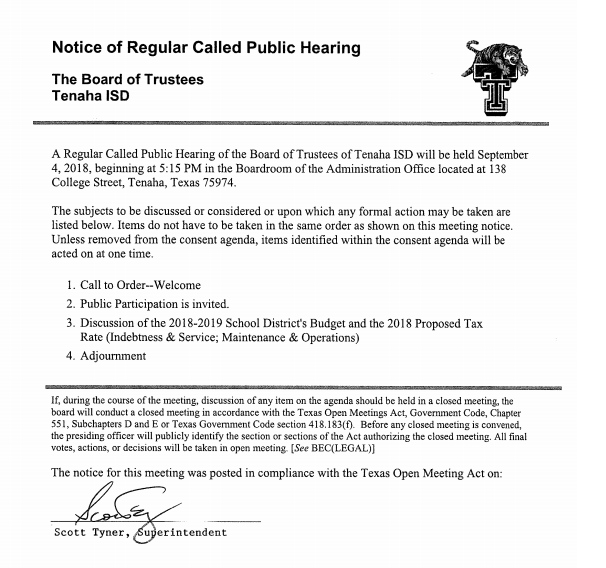 Tenaha ISD will have a school board meeting on August 20th at 5:30 p.m.
Tenaha ISD takes pride in providing the best education possible to the students of Tenaha. The excellent faculty and staff are crucial in achieving academic and extracurricular goals. This year several new teachers were added to the Tenaha ISD family. Luke Balkcom came to Tenaha from Alto ISD. Luke is a graduate of Joaquin High school. After high school he attended and graduated from Stephen F. Austin State University. He has been in education for 13 years. Luke will be coaching and teaching high school and middle school math. He is married to Lauren Balkcom and they have an 8 month old son, Gavin Balkcom. Tammy Hamilton graduated from Joaquin High School. She attended Stephen F. Austin State University after high school where she graduated with a degree in Animal Science. She has been teaching Special Education for 6 years and working in education for 12 years. She proudly joins the Tenaha ISD staff as a special education teacher. Brandy Jenkins joins Tenaha ISD as a science teacher. Brandy graduated from Frankston High School. She is a graduate of West Texas A & M University. This will be Brandy’s 8th year in education. Brandy is married to Jeremy Jenkins and they have three boys, Tyson, Gage, and Jake that keep them busy! Brandy will teach 8th grade science, biology, and chemistry. Jeremy Jenkins is a Cayuga High School Graduate. After high school he attended and graduated from UT Tyler and has been in education for 16 years. Jeremy is married to Brandy Jenkins and they have three boys, Tyson, Gage and Jake. Jeremy Jenkins will be the new Defensive Coordinator for the Tenaha Tigers. Janet Jennings is a 1979 Carthage High School graduate. After high school she graduated from Panola Jr. College with an Associate’s Degree in Business. She later earned a Bachelor of Science in Education specializing in reading. Janet has been in education for 26 years. She will be teaching 2nd grade at Tenaha ISD. She is very excited to be a Tenaha Tiger and more excited to be teaching the future Tenaha Tigers. Andre Jones is a 5th year teacher. He is a native of a native of McGregor, Texas. After high school graduation he attended Trinity Valley Community College and Stephen F. Austin on football scholarship. He has earned a B.S Liberal Studies and American History from Excelsior College and he will graduate in December 2019 with a Masters Degree in Sports Administration from Concordia University of Austin. Andre proudly served 21 years in the United States Army before retiring in 2013. He will be teaching 7th and 8th grade social studies. Lynn Silvey is East Texas born and raised. After graduating from Kilgore High School at the top of her class, she went to Jacksonville College and played piano for the travelling choir while completing an associate of science degree with honors. That led to a move to College Station and a degree in English and history from Texas A&M University in 1985. A masters degree in English and a principal's certificate both from SFA completed her education. With a total of 31 years in education, Mrs. Silvey taught at Union Grove High School, Gladewater Middle School, and Maude Laird Middle School (now named Kilgore Middle School) before moving to Joaquin to teach high school English. She has also taught for Kilgore College, LeTourneau University, and Panola as an adjunct English teacher. Mrs. Silvey is married to Paul Silvey, who is the pastor of Joaquin First Baptist Church, and they have one son Matthew who is a freshman at Texas A&M University this year majoring in history and planning to pursue a law degree. Her older son Zack Phillips, a former US Marine, died unexpectedly two years ago. In her spare time, she enjoys reading, knitting, playing piano, travelling, and spending time with her family. Mrs. Silvey loves teaching and is excited about being a Tenaha Tiger! There will be a Band Booster Meeting on Monday, August 27th, at 6PM. The meeting will take place in the Shelbyville Band Hall. Everyone is invited to attend. The SFA faculty and staff meeting to celebrate the beginning of a new academic year is slated for Aug. 23. Refreshments will be served from 7 to 8 a.m. in the Spirit Lounge of the Baker Pattillo Student Center, and the meeting will begin at 8:30 a.m. in Turner Auditorium. New members of the SFA community will be introduced, accomplishments of the previous year will be highlighted, and plans for the upcoming year will be discussed. Parents can still register their child for the upcoming 2018-2019 school year now! Click link to our Tenaha ISD web page for a complete set of instructions. The students return for their first day of school tomorrow, August 15th . Students and parents can expect several changes for the 2018-2019 school year. There is a new bell schedule. The building will open for students at 7:20 am. Breakfast begins at 7:20 am with the first bell to begin classes to ring at 7:50am. The tardy bell will ring at 7:55 am. Parent pick-up for Elementary students begins at 3:00pm and the dismissal bell for all other students will ring at 3:10pm. Students and parents are invited to Meet the Teacher to find out more about what the upcoming school year will bring. All sizes are stretch fit! If you have any further questions contact Coach Greg Jenkins. Joaquin ISD JH/HS Fall Pictures will be taken on August 29th, 2018. Center Middle School will have a mandatory Parent/Guardian meeting for all Honors/Advanced Math students on Thursday, August 16, 2018 in the CMS auditorium at 5:00 PM. If you are unable to attend, please make an appointment with CMS Principal Jake Henson. Also, review the Honors/Advanced Math Program Packet, sign and return the last page to your child's teacher. The 2017-2018 Dragon Band’s recording of its march, from UIL Concert and Sightreading Contest, received 1st Place at the STATE level of the ATSSB Outstanding Performance Series (OPS) contest. The state round of TMEA Honor Band auditions were also held during the TBA Convention, and the Dragon Band earned 3rd place in the State. A regular meeting of the Board of Trustees of the Shelbyville Independent School District will be held on Monday, August 13, 2018, beginning at 12:30 p.m., in the Board Room of the Shelbyville Independent School District at 343 FM 417 West, Shelbyville, Texas. A special called meeting of the Board of Trustees of the Shelbyville Independent School District will be held on Monday, August 13, 2018, beginning at 12:00 p.m., in the Board Room of the Shelbyville Independent School District at 343 FM 417 West, Shelbyville, Texas. This notice was posted in compliance with the Texas Open Meetings Act on August 8, 2017 at 12:00 p.m.
Center Middle School girls may pick up their athletic clothing on Monday 8-13-18 and Tuesday 8-14-18 from 9-11 am and 4-6 pm. A Regular Meeting of the Board of Trustees of Center ISD will be held August 8, 2018, beginning at 12:00 PM in the Center Independent School District Administration Boardroom 107 PR 605 Center, TX 75935. Center Middle School is inviting all 6th grade students and parents to our 1st ever 6th grade orientation on Thursday, August 9, beginning at 3:30 in the middle school auditorium. Starting at Staff will welcome students to our campus and provide them with an overview of what middle school is all about. We will discuss various aspects of middle school life as well as some best practices in order to have a successful first year at CMS. Students will also be given their class schedule and get a chance to go to each of their classes to meet their teachers. At 4:30 students will return to the auditorium and we will ask parents to join us. This time we will address the parents about middle school procedures as well as have a question and answer session with campus administrators. We will also provide a dress code “Do’s and Don’ts” fashion show so students and parents can see what is permissible and what is not at the secondary school level. At 5:00 our Meet the Teacher will begin and parents can then make their way to visit with their student’s teachers. We hope that this orientation will help make a smoother transition for 6th grade students and parents. Please join us Thursday, August 9th for our first ever 6th grade orientation..
Incoming CHS freshmen are invited to join faculty and staff for FISH CAMP! The event is absolutely FREE, and participating freshmen will receive a free t-shirt and lunch! - Win awesome door prizes ALL DAY LONG! - Students will have the opportunity to pay their mandatory $10 freshmen dues. - Yearbooks will also be available for preorder - Receive a Fish Camp discount off of the $45 price! Cash/check available. Meet the Teacher and Meet the Tigers this Thursday, August 9th from 4:30pm-6:30pm. Elementary students may bring their school supplies to leave in the classroom. Junior High and High School students may pick up their schedules. Meet the Tigers will begin at 6:30pm in the SEC! Don’t miss this back to school event. Don’t miss this big event! The Shelbyville Dragon Band Boosters are proud to announce its officers for the 2018-2019 school year. Membership in the band booster program is available to anyone that is interested in supporting the dragon band. On Saturday, August 11 at 7AM the boosters will be cleaning the concession stand in preparation for the upcoming football season. The next band booster meeting will be held on Monday, August 27 @ 6pm in the band hall. For more information about the band boosters, please contact ConCynthia McClelland (President) 936-572-0216. Center Middle School football players can pick up their equipment on August 13th and 14th from 4:00 p.m. - 7:00 p.m. at the CMS Field House. If there are any Joaquin High School students interested in participating in CNA classes at Panola College, please contact Mrs. Porter before August 10, 2018. Shelbyville ISD Meet the Dragons will be held Aug. 21st @ 7:00 pm in the Gym/Band Hall Complex. Shelbyville ISD Meet the Teacher will be August 16, 2018 3:30 pm-5:30 pm. Students are encouraged to bring school supplies. Joaquin Meet the Teacher will be held on Thursday, August 16th.